Let Ravinia Make You The Star! We are here to assist with your family gatherings, birthday celebrations, corporate networking events, and client entertaining. Secure your group tickets, space and catering in one place! New this season: All-inclusive packages! For groups of 10 or more, we will reserve your tickets and space in some of the best locations in the park, set up rental chairs, and cater your party. Just sit back and enjoy the evening! They are customized for the lawn, tents, or exclusive covered options in the Dining Pavilion. Don’t delay on reserving your spot; several concerts are sure to sell out before public ticket sales open over May 7 and 8. Request your group event before then to get tickets before the general public! Our staff is ready to assist you in creating a spectacular and memorable event, featuring world-class entertainment and all-new catering options crafted by Ravinia’s executive chef. Captivating sounds and beautiful grounds are an enchanting setting for a memorable event to dazzle your clients, friends, families, employees, clubs and organizations. We host company dinners and fundraisers for hundreds, intimate picnics on the lawn, and everything in between. Note: Your purchase of catered food and beverage for your event comes with the ability to purchase tickets through Group Events. There is no discount on lawn tickets. 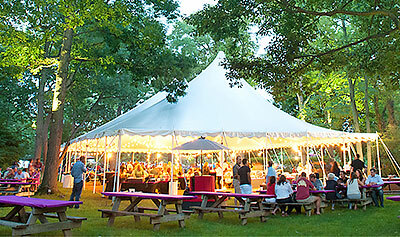 Ravinia’s tents are perfect for gatherings with clients, friends, family or employees. Learn more. Let Ravinia plan and prepare for your next lawn party. Learn more. Hosting an event makes you a financial supporter of the oldest and most successful outdoor music venue in North America. That's because the facility entrance fee is a tax-deductible donation to a not-for-profit organization. Since local ordinance limits off-season use of Ravinia facilities to donors, this makes you part of an exclusive group, and your event will stand out as a unique experience. President's Circle-level donors may host an event at the Ravinia Festival during our non-concert season. View some of the benefits that come along with your contribution. We know just how special every event is, and work hard to ensure every single moment is memorable. Learn More. Ravinia is your one-stop shop for client events. Learn More. Every detail is planned and orchestrated to create the signature style of your event service is attentive as it is imperceptible. Learn More.